Once again, The Ritz-Carlton, Bali has been honored with a prestigious World Luxury Hotel Award. 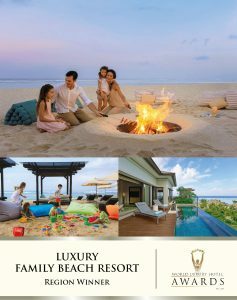 The acclaimed beachfront luxury resort in Bali was named as the Best Family Resort in the Region at a gala event in Bali on 10th November 2018. “It is always a thrill to be recognized in prestigious global awards and to win the Best Family Resort in the Region for two consecutive years at the World Luxury Hotel Awards is quite an accomplishment and one for which we are exceedingly proud. The Ritz-Carlton, Bali believes in creating unforgettable memories for its guests, including children and it is with great pleasure that we welcome families to the resort. Here they can enjoy a vast array of family-oriented activities and experiences, including luxurious stays in our spacious private pool villas and suites,” says General Manager Karim Tayach. Established in 2006, The World Luxury Hotel Awards are the pinnacle of achievement in the high-end hotel market, offering international recognition to hotels around the globe, as voted for by guests, travelers and industry players. Over 300,000 international travelers make their selection each year. Ritz Kids provides an atmospheric clubhouse and swimming pool and offers inspired and educational activities for kids of all ages, from Night Safaris, to Little Fisherman, to being a Little Mermaid for the day. Family-oriented activities include beachfront cinema under the stars, kite flying and participation in the Turtle Conservation program. As well as luxurious accommodation with ample space for the whole family to spread out, the ocean front swimming pool and white sandy beach is a natural magnet for fun family vacations. 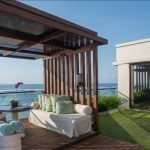 This award winning best hotel in Bali offers guests a 5-star luxury experience with the aim of creating the vacation or business experience of a lifetime. Guests discover supreme luxury in space, location and facilities as well as a highly attentive personalized service from the Ladies and Gentlemen. The resort’s dramatic setting in the beautiful tourist enclave of Nusa Dua incorporates, lush tropical gardens and a beachfront of dazzling white sand. Guest can enjoy sublime dining experiences and revel in the luxury of superb lagoon access suites and best villas in Bali. A dedicated concierge provides inspirational itineraries for those who wish to explore the sights and sounds of the island, while a plethora of activities are offered within the resort, from health and wellbeing pursuits, to Balinese inspired Soul Purification rituals, to non-motorized water sports. The resort also makes an inspired choice for meetings and conferences in Bali, while its romantic beachfront setting and choice of elegant venues create a dreamy setting for destination weddings.